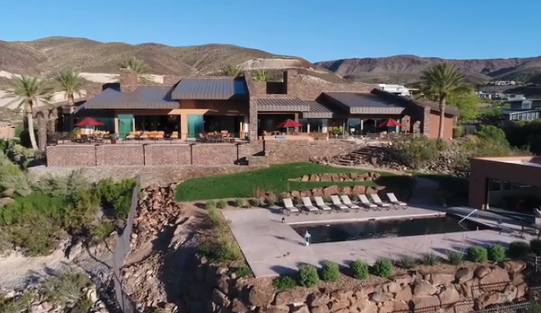 The clubhouse of DragonRidge is an award winning design of stone and glass featuring a gourmet dining room overlooking the Las Vegas skyline, two mixed grills and lounges, a fitness facility, a swimming pool and a golf pro shop. The new 10,000 square football room was a recent expansion to the clubhouse to allow for larger events. A complimentary social membership to the country club is provided to owners upon application approval. Different packages are available including golf, sport, corporate and social membership for residents and nonresidents of MacDonald Highlands. In addition to DragonRidge, MacDonald Highlands’ master plan includes three neighborhood parks encompassing approximately 10 acres that will feature tennis, basketball and volleyball courts, play areas and picnic facilities. MacDonald Highlands is also planning five miles of fitness trails that will meander throughout the community and provide access to nature trails that lead deep into the surrounding mountainside. Reaching an elevation of 2,700 feet, MacDonald Highlands’ dramatic, hillside community features panoramic views of the Las Vegas Strip, the valley’s mountain ranges and private DragonRidge Country Club below. Carefully crafted to blend with its mountain environment, has become one of the premier luxury developments in Southern Nevada. As large estates begin to climb into the hillsides or sprawl along the golf course, prospective buyers are discovering the breathtaking views from these heightened elevations. To learn more about the community and how you can purchase a home in the MacDonald Highlands neighborhood, contact us on our website or call 702-614-9100.